I love reading. If there were any questions about it, you could come to take a look at my house, where there are bookshelves and stacks of books everywhere. The interesting part about it is that this is a fairly new obsession for me. When I got married, I had hardly read at all besides the required reading for college. I remember going to the library when I was younger and picking out books, but I don’t actually remember reading them. Something clicked, however, after I got married and maybe it was the fact that I had more time on my hands that I started reading. I started reading a lot. Sometimes, I feel like I’m reading more than I actually am when I count finished books. 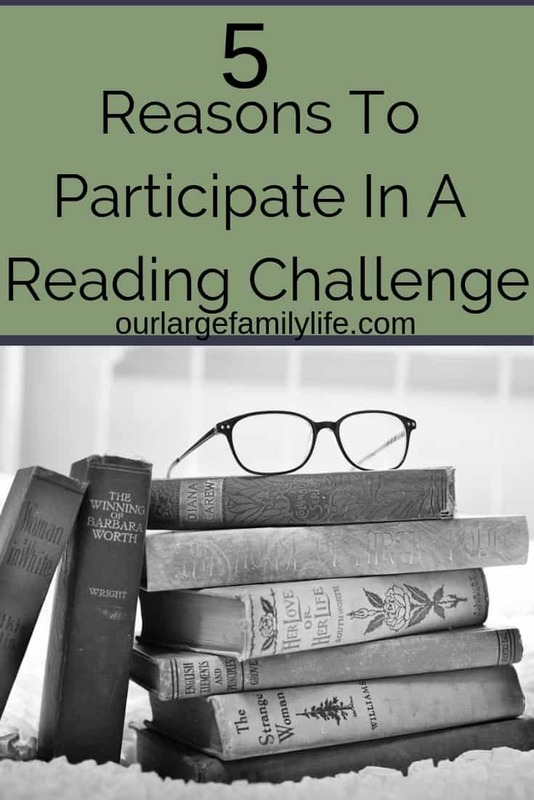 I also get in a rut and tend to read the same type of books over and over versus trying something new, which is why I am excited to take part in a couple reading challenges this year. 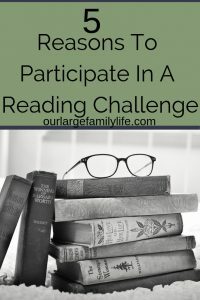 Why would I need a reading challenge if I am already a reader? There are a number of different reason to participate in a reading challenge, even if you already are a reader. A book challenge gives you accountability, especially if you do it with a friend. In past years, I just think that I will read more next books next year, but I never know because I don’t keep track. Doing a book challenge allows me to know if I have hit my mark on my goal to read more books, and it’s not just more books, but new books as well. This year, with the 2 book challenges that I have chosen to take part in, part of the challenge is to write posts about the books read. This adds in even more accountability. I find I think I read more than I actually do. This will allow me to see forward progress and see how much I read and finish. Reading challenges make you a more purposeful reader. I already know which books I will be reading this year for the challenge. Usually, I finish one book and read another or start one and forget it based on recommendations I see at the time, but I know I need to start and finish these books. The TBR Challenge is especially great because of my book buying habits. It’s forcing me to read books I’ve bought but then got pushed aside. One of my habits to just to start reading things that I see recommended. There usually isn’t any preplanning involved. When you start the reading challenges you know ahead of time which books you are reading, which is definitely a new concept for me. Reading challenges often have different categories of books to read. 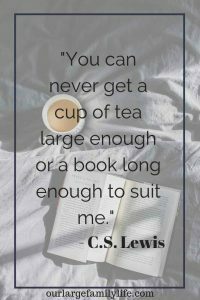 This gives you the opportunity to read books you might not otherwise have chosen. It is quite easy to find a genre we like and stay there. A reading challenge guides us to push beyond where we are comfortable and to make our world wider. A couple of categories that are challenging me this year are a tragic novel (because who wants to be sad) and a very long classic (I get easily distracted, not to mention the whole 7 kids thing). Les Mis has always been on my reading list, but also daunting because of its size. I am excited to finally dig into it this year. I also have the bad habit of ignoring all things that need to get done once I’m really into a story, so hopefully, I can pace myself. Reading challenges allow you to find new people who love reading as much as you. Most reading challenges have ways to connect online through social media. You can also go through the challenge with a friend and discuss the different books you are reading. One of the best things about reading is finding those who enjoy it as much as you do. Reading Challenges allow you to form the habit of reading. 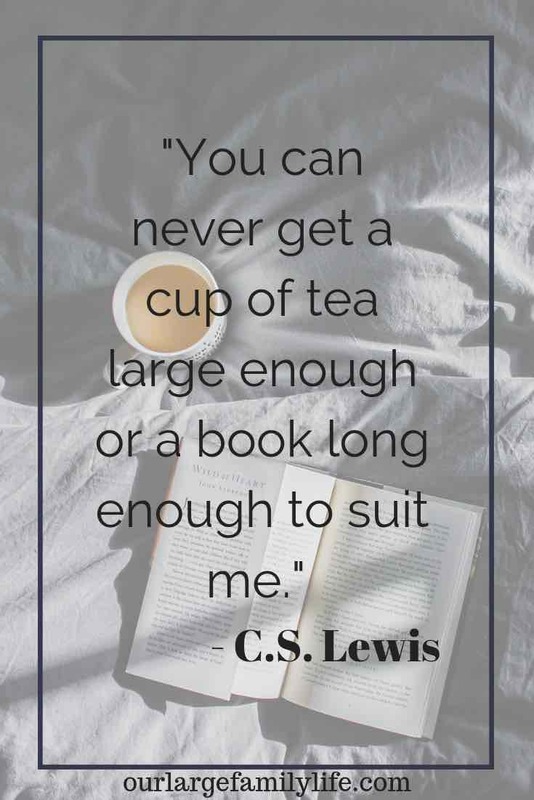 Knowing you have the goal to read a certain number of books allows you to look for the time to finish them instead of just hoping it happens. Right now my goal is to be in bed by 9:30 so I can read for a half hour before I sleep. I will probably read at other times throughout the day, but if I don’t, I know I will have that time at the end of the day. It also helps you form habits about trying new books instead of just ones you know you will like. Need help track the books you read? Sign up below and I will send you a reading log so you can keep track of everything you read this year! I am really excited to take part in 2 different challenges this year. I already feel more purposeful in my reading although I’ve barely started. Reading challenges are a great way to be more intentional about reading. You can find community, get out of your comfort zone, and make reading a habit in your life. If you want to find a reading challenge, Pinterest is a great place to look for different challenges. Modern Mrs. Darcy also puts out challenges every year, that you could check out. What reading challenges are you participating in this year?